The White Tree Fund is an incorporated non-profit organization supporting charities engaged in crisis response, humanitarian programs, literacy and environmental initiatives. The first TWTF website was a creative collaboration with the fund's founder Lara Sookoo. 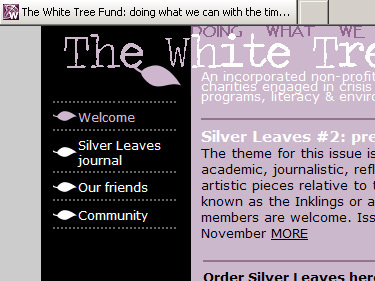 I subsequently redesigned the site from scratch, incorporating (with permission) The White Tree by internationally renowned artist Ted Nasmith. After approval from TWTF the new site was released in September 2008.